In 1992, when Nepal held its first parliamentary elections under the 1990 Constitution, the polls cost just Rs 110 million. In November-December last year when the first parliamentary-provincial elections under the 2015 Constitution were held, the Election Commission (EC) spent that much in just repairing old vehicles. The total cost of the November-December polls was Rs 10 billion –- 181 times higher than in 1992, and double the amount allotted for the second Constituent Assembly (CA) elections in 2013. One may argue that the election budget may have rocketed because of inflation and the necessity of simultaneously holding two tiers of elections. But the 1992 elections budget is equivalent to just about Rs 810 million in today’s currency value. “The latest elections were much more expensive than all the past polls, even after adjustment for inflation,” says Nilkantha Uprety, former Chief Election Commissioner. 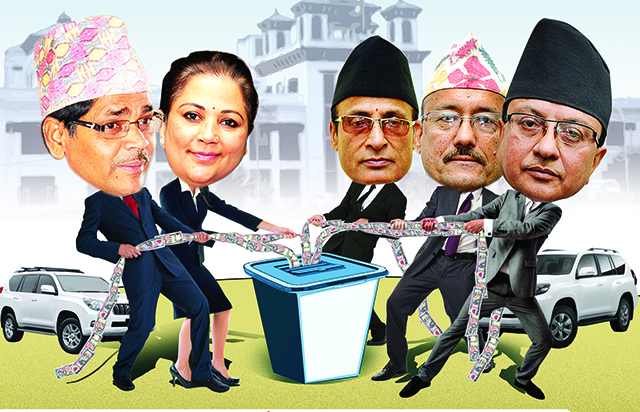 A Himal Khabarpatrika investigation has found that the parliamentary-provincial polls were wasteful because all Election Commissioners were hand in glove for kickbacks. They bought luxurious vehicles and unnecessary equipment and materials at inflated prices. They even submitted fake bills, and transferred the secretary who refused to go along with the scams. Chief Election Commissioner Ayodhi Prasad Yadav and Election Commissioners Ila Sharma, Ishwari Prasad Poudel, Sudhir Kumar Shah and Narendra Dahal unanimously decided to buy five luxury vehicles for themselves. When Secretary Gopi Nath Mainali opposed their decision, he was transferred out of the EC –- a move that violated the election code set by the EC itself. After removing Mainali, the EC fast-tracked the procurement process to buy the five luxury vehicles, each costing Rs 23.3 million. Sources say the five Election Commissioners got a cut of Rs 10 million from this purchase, which they divided up among themselves. Despite having four printing machines at its disposal to print Voter ID cards, the EC bought another machine for Rs 160 million. But the new machine was not used to its optimum, and voters were ultimately allowed to cast ballots by just showing citizenship cards. Chief Election Commissioner Yadav took home TVs and air-conditioners bought for his office. Election Commissioner Ila Sharma was caught on CCTV camera taking a TV set out of her office. Her daughter rides a car owned by the EC. She has allowed her domestic help to use a scooter bought by her office. The EC spent a huge amount of money on producing, publishing, airing and broadcasting voter education materials, clearing the payments for work that was never done, or only partially completed. Sources say the Election Commissioners ordered their accounts department to pay documentary makers who submitted blank CDs. If 10,000 copies of pamphlets were printed, the bill submitted was for 100,000 copies. The Election Commissioners approved all fake and forged bills, claiming their cuts. And media houses that refused to give them kickbacks were not given public service announcements. As a result, voter education was so ineffective that as many as 1.7 million votes were invalid in local elections. More than 1 million and 1.5 million votes were invalid in parliamentary and provincial elections respectively.